This document shows you how to create a new WordPress website. This article shows you how to create a new site inside of the WordPress site network. This process works across all WordPress AWS environments PROD (prod), DEV (wwwdev), TEST (wwwtest), & LEARN (learnwp). WordPress Super Admin credentials. Regular site admins will not be able to create new websites. This series of steps are the same for each WordPress environment. Simply replace the URL with the proper WordPress environment to execute these steps on each environment. For the purposes of this tutorial, I will document these steps using our DEV environment (wwwdev). Navigate to the Network Sites list by going to My Sites > Network Admin > Sites. Hover over the 0template site (it should be Site ID 2) and click Copy. Type in the new site address and site title. 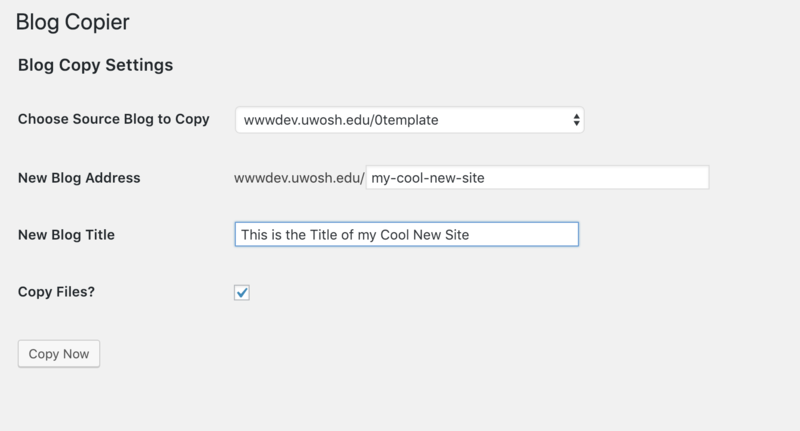 Leave the source site to copy as wwwdev.uwosh.edu/0template and leave the "Copy Files?" checkbox checked. Navigate back to the Network Admin site list and find your newly created site and start editing.